← The Power of the Personal Project. Get Inspired! Reposted from the US Postal Service Born in the Bronx, New York, and raised in Teaneck, New Jersey, Rudy Gutierrez received a bachelor of fine arts degree from Pratt Institute in Brooklyn. After graduating, he made a career for himself in the art world of New York City, where he has worked for more than 20 years. His art has appeared in publications such as Rolling Stone, the New York Times, and Ms. Magazine, as well as on the cover of recording artist Carlos Santana’s multi-platinum album Shaman. Gutierrez’s clients have also included Harper Collins, Sony, Scholastic, and Verve Records. Influenced by indigenous cultures and his Puerto Rican heritage, Gutierrez incorporates the rhythm of urban life in his art, creating abstract, sensory images that are rich with emotion. His unique style has won him a gold medal from the Society of Illustrators, among other awards. His work has been exhibited internationally at shows driven by social causes, one of which benefited the victims of 9/11. When the power of love overcomes the love of power, the world will know peace. Hendrix would agree. Since 1990, Gutierrez has taught at his alma mater in the Communications Design program. Jimi Hendrix (2014) is his first project for the U.S. Postal Service®. To see more of Rudy Gutierrez’ work, go to his Altpick.com page. This entry was posted in Altpick, Art, Design, Illustrations and tagged abstract, art, hendrix, Rudy Gutierrez, urban, usps. Bookmark the permalink. 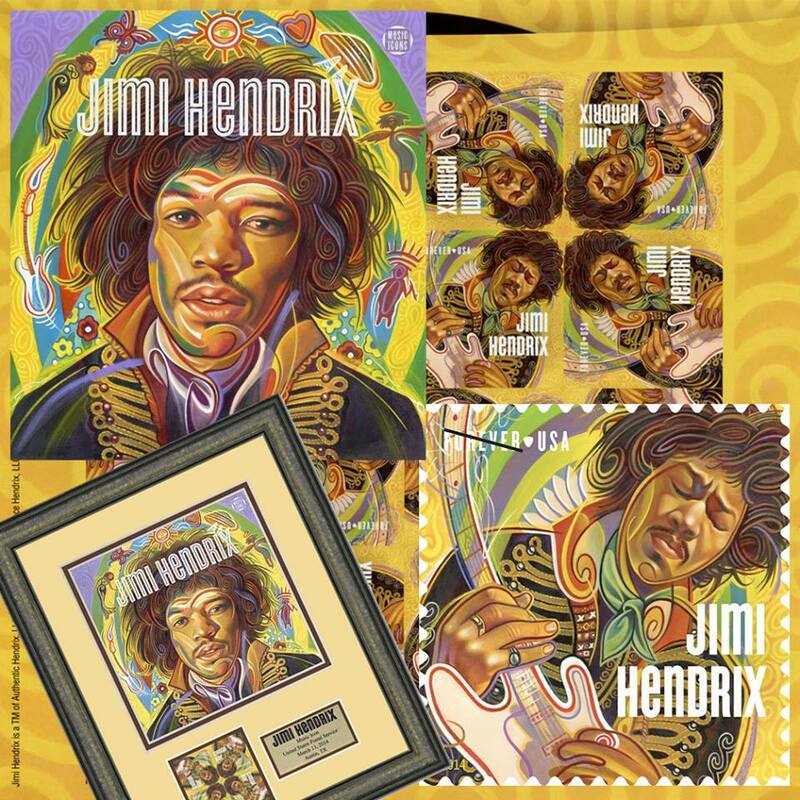 Pleased to see the stamps of the music legend Jimi Hendrix. Video is the best part of your blog post. How much this postage stamp does cost? Well posted, keep sharing more interesting with us.